CD Review - Kekko Fornarelli Trio: Kube Room of Mirrors. Kekko Fornarelli (pno. Rhodes. Sunth); Luca Bulgarelli (bs); Gianlivio Liberti (dms). Inspired by the late Swedish pianist, Esbjorn Svensson, Kube Room of Mirrors is Italian pianist Fornarelli's attempt, and I quote, to draw jazz out of the narrow circuit of its appreciators, bringing it to the general audience. Whether he will achieve this in today's pop cultured musical climate is debatable. However, what is beyond discussion is the man's talent both as a pianist and composer. I'm not normally susceptible to a program of undiluted originals but this is as compelling a piano trio disc as I've heard for many a long 32 bars. The moods are absolutely enthralling ranging from, exploratory probing - seeking out exactly the right harmonic progression before building up for the big finish - to straight ahead contemporary jazz and the many nuances in between. These include Debussy-like passages that are integral to the flow rather than thrown in for mere effect and a measured use of Synthesizer. Above all, this is a trio with all of the component parts contributing.at the highest level. Bass and drums are outstanding giving Fornarelli the stimulus and impetus for his improvisations whilst creating their own texture and colour to the musical canvas. If you were/are into EST or Brad Mehldau this CD should appeal. Check out this sample. Kekko Fornarelli performs on May 16 at the Italian Cultural Institute in London (39 Belgrave Square, London SW1X 8NX). It would be nice to hear him in other parts of the UK. Ray Stubbs on Louisiana Red. Americans that we had supported or backed during those years. performer and we shall never see the likes of him again. Rock on Red wherever you may be. Andy Champion (double bass), Paul Edis (keyboards), Graeme Wilson (tenor & baritone saxophones), Mark Williams (guitar) & Adrian Tilbrook (drums). New CD in the can (release date hopefully sometime soon), Andy Champion’s five piece band played a gig on home turf down in the Ouseburn for Schmazz @ The Cluny. Studio sessions behind them, the boys were in top gear from the off. Highlights were many, none more so than A Line Made by Walking. 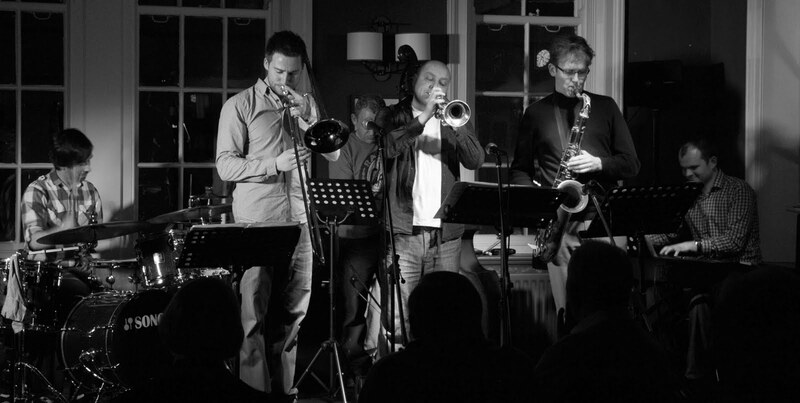 Guitarist Mark Williams and saxophonist Graeme Wilson appear to operate by telepathy in developing a line; Williams, then Wilson, Wilson, Williams, Williams, Wilson, then in unison. Never Ever (it is on the new CD) with an arco bass pattern also featured Williams. What’s For Breakfast? was playful, deceptively so, as Wilson’s baritone signalled a power surge with the band going into overdrive. Up river a half mile or so from the Cluny is a Tyneside landmark linking a beer drinker’s paradise – The Crown Posada – via seemingly endless, steep stone steps to another beer drinker’s paradise – The Bridge Hotel. Locally this Bacchanalian Stairway to Drinker’s Heaven is known as Dog Leap Stairs. Bandleader Champion likes a half of shandy now and again so he thought it a good idea to write a tune and call it Dog Leap Stairs. On the evidence of this first public airing of the tune it could become a firm favourite (Wilson on baritone and guitarist Williams once more impressed a most receptive audience). Oh, yes – the tune is on the new, hopefully soon to be released CD. A new tune – Second Season – let those who didn’t know it that Graeme Wilson is a fine lyrical tenor player. He could have been playing for vocalist Ruth Lambert (they have worked together for years) or perhaps Zoe Gilby such was the delicacy. More familiar ACV material followed – Giant Mice (forever more in cyberspace folklore - checkout Dancing Dude on YouTube) and another beer related number Dust Red (checkout the excellent Consett Brewery) featured a bass solo and Wilson’s tenor. Paul Edis (keyboards), the quiet man of the quintet is always impressive whatever the context and here at the Cluny was no different. The man at the back – Adrian Tilbrook – looked like he was enjoying the occasion and the encore (Without Bones) has become something of a tradition. If you haven’t heard the band play this number then get along to one of their gigs asap. It is difficult to convey just how good it is. Drums, guitar, tenor, bass, keys – all play their socks off. If you’re within a hundred miles of Leeds on Thursday night do yourself a favour and get along to Spin Off. It just so happens ACV will be there. Above photo courtesy of Adrian Tilbrook. PS: Ignore Snap, Crackle and Pop at the start!. CD Review. Zoe Rahman - Kindred Spirits. Zoe Rahman (pno/harmonium); Idris Rahman (clt/bs.clt); Oli Hayhurst (bs); Gene Calderazzo (dms); - on one track - Courtney Pine (alt.fl.). Kindred Spirits is Zoe Rahman's latest project - the intent being to draw on music from differing folk traditions into one digestible whole. Hence we have elements of her Bengali, English and Irish heritage gelling together making for some intriguing compositions. Butlers of Glen Avenue comes across beautifully and could be subtitled The Wearing of the Green Sari. Idris Rahman's clarinet captures the feel of an imaginary Asian Jazz Ceilidh! although Calderazzo's drums are far removed from Bodhrans and Tablas! Outside In enables Zoe to explore, probe and delve into her esoteric side with rich chording, gentle mood swings - it is a statement - This is me! Imagination - a piece by Bengali writer, musician, artist and Nobel Laureate, Rabindranath Tagore - also delivers and allows Hayhurst to chip in with a bass solo. Courtney Pine plays some nimble alto flute (try being nimble on an alto flute!) on Conversation With Nellie. 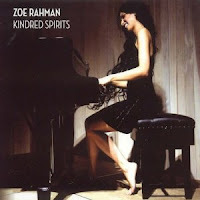 It's an interesting and at times compelling album that serves to remind us just what a fine player and composer Zoe Rahman is. Zoe is in Courtney Pine: Europe which is part of the Gateshead International Jazz Festival Saturday March 24 - 7:30pm. On Sunday March 25 She is part of a triple bill featuring Robert Mitchell 3io, Ambrose Akinmusire and her own quartet. The Quartet is as per the CD with Davide Mantovani replacing Oli Hayhurst on bass. Known as one of the most diverse artists in jazz his highly innovative piano style and philosophy of jazz improvisation merges his love for great music from every era with his own creative imagination. A pianist, composer, arranger and educator, the American artist has an ability to bring jazz and classical styles alongside each other, with equal brilliance. Here he performs with his trio featuring Jason Marsalis, youngest son of Ellis Marsalis, on drums and Roland Guerin on bass, both based in New Orleans and immersed in its musical traditions. Closely associated in his early career with the music of Wynton Marsalis, his style, similar to that of Oscar Peterson, steeped in the gospel and bebop traditions, makes him a truly compelling artist in any context. “Marcus Roberts is a superb improviser with a considerable compositional gift.” The Times. 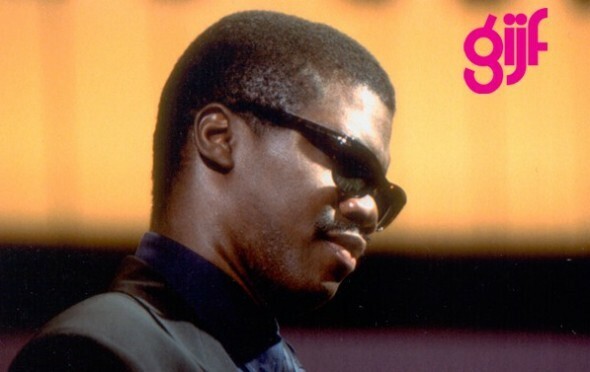 “Marcus Roberts is easily one of the most prolific pianists of his eneration.” All About Jazz. Follow this link to hear a sample of Roberts' phenomenal technique - you'll be on the phone for tickets before the track is ended! I Get a Kick Out of Ruth @ The Cherry Tree. Ruth decided she was Taking a Chance on Love which as we all know is a much bigger deal than taking a chance on Mushroom Fritters with Mozzarella, Pine Nuts, Roquet and Basil Oil. which is what I did. It worked out fine for both of us! Whilst I was delighting in the piquancy of my starter Our Lady Ruth gave out with Dream a Little Dream of Me, What is This Thing Called Love and The Nearness of You. All done with the Lambert trademarks - the permanent smile you're sure is directed to you alone, the light falsetto swoops that tell you this is no mere mundane reading but an adventurous sortie which could end in disaster but doesn't. How could it with such a safety net as Messrs Collingwood, Harland and Smith? My Confit of Pork, Lyonais Potatoes, Apple and Black Pudding arrived as Ruth went into that song from Black Orpheus which seems to have a thousand titles. This version was A Day in The Life of a Clown - one thing is sure - the Chef at the Cherry Tree is no clown! Blue Skies and Black Coffee for Ruth and a bottle of Black Sheep for me before it was time for Time After Time. Ruth and Neil - Voice and Bass - played the opening chorus before Stu took over for some exploratory piano playing. We have some great keyboard men in the north east and Stu is certainly up there with them. Likewise, on drums, Paul Smith too is in contention. Neil Harland? - Daddy Cool! The second set began with Is You Is or Is You Ain't My Baby and S'Wonderful. Mine began with Pistachio, Almond and Apricot Tart and it too was S'Wonderful! Fever, One Note Samba, It Had to Be You and Autumn Leaves - a request. Some years ago, I requested Ruth to sing Blue Champagne and I'm still waiting. This guy gets his request within 5 minutes! Mind you he was younger than me although I too was young(er) when I put my request in. I Get a Kick Out of You wrapped it all up. Just heard that blues legend Louisiana Red passed away aged 79 on February 25. The guitarist died in a German hospital having lived in Germany for many years. I recall Louisiana Red playing a memorable gig at Newcastle's Corner House in 1987 with Ray Stubbs' R 'n' B All Stars. Sadly missed throughout the blues world and beyond. 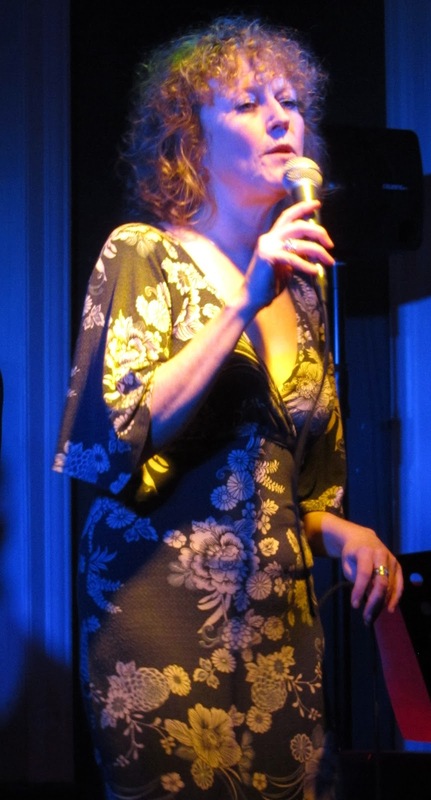 Popular songstress Ruth Lambert makes a welcome return to the Cherry Tree Restaurant, 9 Osborne Rd., Jesmond (Tel 0191 2399924) in the company of Stuart Collingwood (pno); Neil Harland (bs); Paul Smith (dms). A formidable line-up equalled only by the artistry of the Chef and the service from the floor staff. Joe Montague (dms); Jiannis Pavlidis (gtr); Matt Anderson (ten); Max Sterling (bs). The band came up from Leeds - logistically it would have made economic sense to bus the audience down to Leeds. However, I've long given up expecting jazz fans to turn out in their numbers, or maybe they did - all 8 of them. What's the answer? I don't know and nor does ace saxist Simon Spillett who posed a similar question in this month's Jazz Journal. In fairness, the bar itself was totally deserted so it wasn't just jazz fans who opted to stay in - maybe they were all watching Upstairs and Downstairs! Matt Anderson is no stranger to the North East having made appearances at The Bridge and Hoochie Coochie with various bands - all enhanced by his laid back cool sounding tenor sax. This was music from the drawing room side of the jazz canon and none the worse for that. It swung delicately with Anderson weaving his lissom lines around a mix of standards and originals. When Sunny Gets Blue and Skylark really stood out as things of beauty. Russell remarked that Pavlidis looked a bit like Barney Kessel and, at times he did sound like the late grandmaster of the guitar. Sterling's bass work was in accordance with his name whilst leader Montague was, at times, gently swinging and at other times driving it ruthlessly forward. Despite the feeling of loneliness in the audience - it was a good gig that deserved better support. Peter Gilligan (pno); Paul Grainger (bs); Elliott Lewis (gtr); Dan Reed (dms). Pete and Paul kicked it off with The Nearness of You and the two PGs gave plenty tips to the listeners on just how to play their instruments (PG Tips - get it?) meanwhile, during the bass solo, Pete took time out to phone a drummer. These two guys rank high in my ratings. It was the usual audience mix at The Café by which I mean the unusual! A contingent from the RSC were in and I'm told that later, after I'd left for the Splinter @ The Bridge gig, one of their number sat in on piano and impressed Peter Gilligan - no mean feat for a pianist. Also in the audience was a party from Nottingham one of whom was guitarist Elliott Lewis who, armed with his Maccaferri sat in and drew the first round of applause for his chorus on Take The A Train. Elliott is with a gypsy style band - Maniere des Bohemiens who are supporting the Tea Pad Orchestra at The Cumberland Arms in April. If his fellow Bohemiens are of similar calibre it should be un formidable gigue. Back to today. Next up was There Will Never Be Another You with all three guns blazing. Sweet Georgia Brown and I'll See You In My Dreams had Daniel Reed on drums - this really was the business. Sadly, the young Djangologist had to leave at this point - he had about 8 minutes left to catch his train! Hope he made it! Then again, if he didn't - Nottingham's loss would have been Newcastle's gain! The Joe Montague Quartet - Joe Montague drums, Jiannis Pavlidis (Guitar), Matt Anderson (Tenor Saxophone), Max Sterling (Double Bass) - are tonight's attraction and, once again, predominantly products of Leeds College of Music. However, it's not the only game in town. Over at the Jazz Café the Sunday (late) afternoon Jam Session appears to gathering momentum once more and serves as a nice appetiser to the latest Leeds invasion. 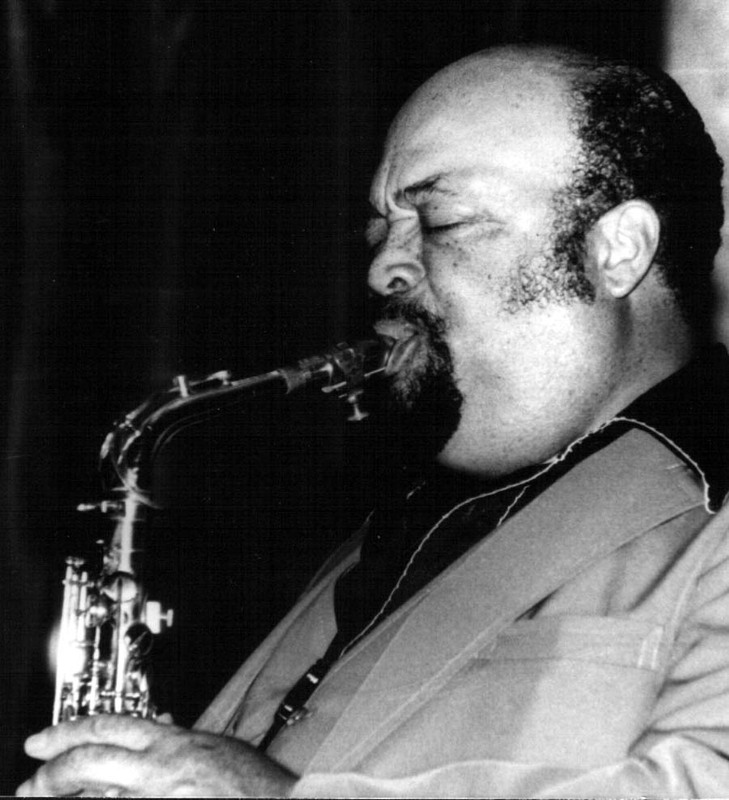 Not many sax players could hold their own alongside Stitt but Red, who was comparatively unknown over here at the time, did it beautifully on both alto and tenor. Listen to The Way You Look Tonight from the duo. I'd heard reports of his failing health but it still came as a shock to hear that he'd died yesterday. Billie Holiday - Back in Your Own Backyard. Some nice Lester Young tenor and some great cat pictures! Liz - for me..John Coltrane and Johnny Hartman: My One and Only Love.gets me every time! Kev - The 4th Chair Trumpet Player. A must for all trumpet players! Kev - A longer version of the above. Ann Alex - Paul Weller and Amy Winehouse. Don't Go To Strangers. Miles - Charlie Shavers/Buck Clayton Trumpet Battle. Djangologie @ The Corner House. February 23. Jazz North East's latest concert featured the welcome return of Djangologie. The band has undergone something of a transformation of late with a minor change of name (formerly Djangology) and the two guitar chairs previously occupied by Paul Donnelly and Dave Harris have been taken by James Birkett and Giles Strong. Bass player Mick Shoulder is a big fan of Django Reinhardt and it his passion for the music of the Manouche that makes this band the success it is. The Hot Club style works well in the hands of first class players and this quartet is a first class outfit. Coquette, Belleville, Nuages, Minor Swing - all great tunes associated with Django - were a joy to listen to. Violinist Emma Fisk is a virtuoso player, likewise James Birkett and together they knocked out cracking solos on Coquette, Birkett again on Belleville and unsung rhythm guitarist Giles Strong featured on Nuages with Fisk producing a wonderful coda. The nuances of the music weren't lost on the audience although Shoulder's schoolboy French was lost on many of those present! Douce Ambiance, Stompin' at Decca and Sheik of Araby were in the pad, the latter featuring some dazzling fretwork from Birkett with Shoulder impressing, as did, yet again, Fisk the Fiddler. Shoulder brought along one or two original pieces - Django's Stomp and In My Quiet Place were stand-out numbers - and there was a genuine empathy between all four musicians with this material and the classic Hot Club numbers. A real highlight was Oh, Lady Be Good with steaming ensemble work, brilliance from Fisk and brilliance from Birkett. This was an evening of exemplary musicianship at the Hot Club du Heaton. Djangologie's next engagement is a week on Saturday evening (March 3) at Northumbria University. A great night is guaranteed. Martha High and Speedometer @ Hoochie Coochie. Thursday Feb. 23. 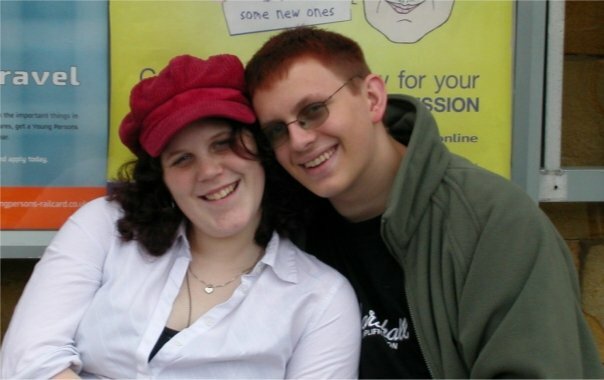 Martha High (vcl); Ria Currie (vcl); Male vocal ? ; Leigh Gracey (gtr/perc); Neil Penny (tpt); Matt McKay (fl/alt/bar); Simon Jarrett (ten); Richard Hindes (bs); Matt "Wildman" Wilding (congas); keyboards? Drums? Nevertheless, this was a stonking gig! It was non-stop funk but with lots of jazz flute and sax from McKay with tenor bursts from Jarrett. Great vocals from Currie and the guy whose name I couldn't find. Then, when you thought it couldn't get no higher, it got higher - literally! This was Gladys Knight, it was Tina Turner, it was the Vandellic Martha it was everything. The band beat out a throbbing rhythm, the horn section were as tight as it gets and the explosion when it all came together was something else. I reckon I'll get back to normal adrenalin levels round about Easter! Mike Papapavlou & Ruairidh Patfield @ King’s Hall, Newcastle University. Feb 23. Newcastle University music students met in the grand surroundings of King’s Hall in Armstrong Building to perform in front of their peers and interested members of the public. Classical, folk, pop, the singer/songwriter – all were represented - and on this occasion two talented musicians played a couple of rather well known jazz tunes. Guitarist Mike Papapavlou and electric bassist Ruairidh Patfield began with I Love Paris. 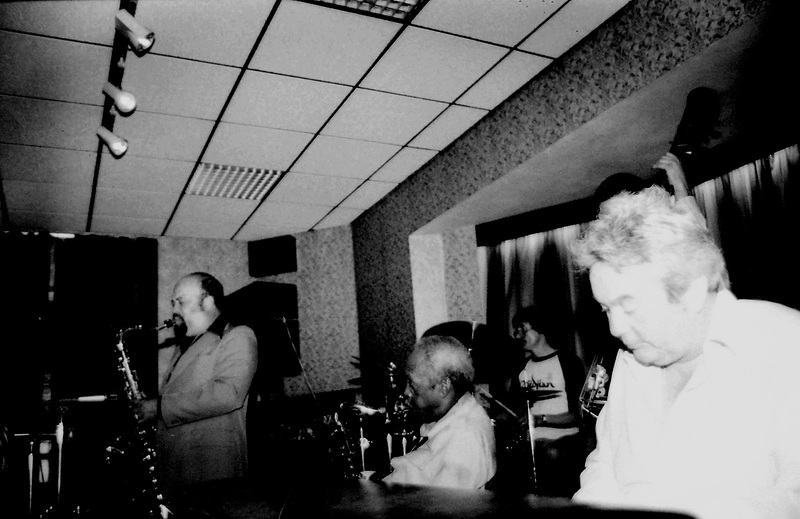 Papapavlou impressed with his technique and tasteful playing of one of the great standards as bassist Patfield offered sympathetic support. Charlie Parker’s Cheryl was well within the duo’s capabilities and won the applause of fellow students – no mean feat given the studied indifference of many a student! Papapavlou and Patfield can be heard most Sundays at Keith Crombie’s Jazz Café jam session. These boys also figure in a quartet and I reckon an enterprising promoter could do worse than to offer them a spot. A special mention goes to Ed Burgon (voice and guitar). A student on the folk degree course, Burgon is a star not of the future but of the here and now. American folk song, the protest song and fantastic original material were at the fingertips and on the lips of Burgon. With jazz it's the way you play them - with Frank Carson it was the way he tells them. He did a lot of charity work particularly in the North East where St Clare's Hospice named a ward after him. I make no apology for paying tribute to him. And what better way to remember him than with a few of his gags. Private Carson I didn't see you in camouflage class today. Thank you very much sir. An Irishman's wife gave birth to twins. Her husband demanded to know who the other man was. Two Irishman went into a pub and the landlord said you’re not allowed to eat your own food in here, so they swopped sandwiches. When the Pope asked Frank if he had ever met Elvis Presley, Carson replied: "No I have not, but it won't be long now." Tomorrow night - Surfeit of Riches. It's happening all over the area tomorrow night (Thursday Feb. 23). Jazz North East present DJANGOLOGIE at the Corner House on Heaton Rd./Coast Rd., Newcastle. Two other gigs within more or less a mile radius - The SMOKIN' BIG BAND open rehearsal is at the Punchbowl in Jesmond whilst the VIEUX CARRE JAZZMEN are at the Millstone on Haddricks Mill Rd., South Gosforth. In the Newcastle City Centre funk/soul band SPEEDOMETER are at Hoochie Coochie whilst over at the Jazz Café GYPSY DAVE SMITH has his regular Thursday gig. Out in "The Sticks" The FIONA CLAYTON BAND + LINDSAY HANNON'S ICENI are at Bubbles in Ashington. REDEMPTION JAZZ play Queen's Hall, Hexham, KING PLEASURE and the BISCUIT BOYS are at the ARC, Stockton and RUTH LAMBERT'S BUSKERS NIGHT continues at the Bell and Bucket, North Shields. Oh yes and on the Sunniside of the street the MAINE STREET JAZZMEN are at the Marquis of Granby! Apologies if I've missed anyone out. See listings in right hand column for further details on these gigs. The student performances in King's Hall start at four o'clock and last for one hour. This week the performers include Mike Papapavlou (guitar) and Ruairidh Patfield (bass) 'performing jazz/bebop standards'. Bass player and Course Tutor at Newcastle Uni John Pope has tied the knot with Medical Lab Assistant Jenn Goodall. After Andy and Zoe it seems as though wedlock is in for double bass players! May all your troubles be violins. CD Review. 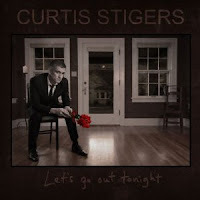 Curtis Stigers - Let's go Out Tonight. Curtis Stigers has been, and still is, many things. There was the rock and roll icon, the jazz singer/saxophone player and latterly the crooner on The Proms cosying up to his "legit" contemporaries. With Stigers what you see isn't always what you get! This latest CD, for me, shows off his voice at its best. The slow, husky croak of a man who isn't tired of life but maybe just a little bit blasé. He's not Tom Waits but he isn't Frank either. Comparisons could be drawn with Sinatra's Only The Lonely - the same feeling of sadness prevails. However, Stigers is of a different generation and his choice of songs include ones from the pens of such post gasbook poets as Bob Dylan (Things Have Changed), Eddie Floyd (Oh How It Rained), Jeff Tweedy (You Are Not Alone), Neil Finn (Into Temptation), Stevie Earle (Goodbye), David Poe (Every One Loves Lovers) and Blue Nile's Let's Go Out Tonight. It's very listenable and ideal Wee Small Hours material - particularly if you've had a fall-out with your woman and failed to find solace in the arms of the recently divorced housewife next door but one - a hypothetical situation I hasten to add! Curtis doesn't play much, if any, sax but there are some nice Miles/Chet trumpet obligatos and even a touch of Bubber Miley from an unnamed player (on my copy). In many ways Curtis reminds me of Madeleine Peyroux inasmuch as, by mid album, a variation of tempo would have been a nice change from the superb but sometimes monotonous rhythm.. Nevertheless, it is well done and the tracks on the CD are very listenable although not necessarily in one go. I'm sure many of these same numbers will be appreciated by the crowd when he reprises them at the Sage Gateshead International Jazz Festival on March 25 which just happens to be the day before the album's.official release on March 26 although it can be pre-ordered on Amazon £8.99 post free. The official CD launch of the Paul Edis Sextet's new CD There Will Be Time takes place at 8pm on Friday 2nd March at the Lit & Phil, Westgate Road, NE1 1SE. Tickets are £7 full price & £5 concessions (claimants, seniors, students) at the door or in advance from the venue on 0191 232 0192. In case you missed my review which was of the rave variety read it here. Peter Papprill Funeral Arrangements - Thursday February 23. Following a request from Peter's family, after the service in Great Ayton and the Crematorium, the venue afterwards will now be at :- Dormans Hall, Oxford Road Middlesbrough. This place will hold many more people than the original venue of Tennis World. The family have also requested that Peter's Musician friends bring along their instruments to Dormans Hall where all facilities are there for an opportunity to play. Much of the music that he loved will be made available, including Bb, Eb and concert parts for players to "have a blow" on the tunes that were associated with Peter. The Service is at 1pm. The Crematorium is at 2pm. and Dormans Hall after that time. #Coda. Please pass the above on to any friends who may not yet know of the alteration. Pete Tanton (tpt); Mark Williams (gtr); Stuart Collingwood (pno); Stuart Davies (bs); Steve Wall (dms). I've given up on sanitising audience numbers by saying it was a select gathering. The few that turned out tonight weren't "selected" but came because they wanted to hear some good music! There should have been more - many more. Bebop with a contemporary feel, Calypso rhythms, jazz rock - this line-up could play for England if it wasn't for the fact that one of the players was Irish (Mark Williams) and another American (Pete Tanton)! No point in highlighting any one individual - all chipped in with solos that ranged from very good to awesome. The compositions too were first class. Tanton's , Barbados - not to be confused with the Charlie Parker tune of the same name - Collingwood's Nautical, Davies' Double Bubble and William's Booze Blues just some of the attention grabbing pieces that drew the maximum applause from the minimal audience. Hang your head in shame those of you who stayed away - you missed a good one. Tonight's musical attraction at the Cherry Tree Restaurant (9 Osborne Rd., Jesmond - tel 0191 2399924) is trumpet/flugel horn player Graham Hardy with the Paul Edis Trio. This comprises two thirds of the Paul Edis Sextet whose CD I recently reviewed so enthusiastically. In case you are worried about the missing third - don't - the food will make up for it! Tonight's BBC 4 programmes are detailed elsewhere to which all I can say is "Thank God for iplayer and catch up TV". The reason being that Ex Extreme - the heir to David Carnegie's Extreme Measures - are tonight's Splinter @ The Bridge band. Well worth the fiver admission. Meanwhile, over on Pink Lane, from late afternoon drop in on the Jazz Café Jam Session. After flagging for a week or two I'm told last week was well attended with a lot of new players sitting in and this week promises to be similar. So bring your axe or just your ears and soak up the charismatic atmosphere of a unique venue. Even earlier - from 4:00pm - The Narrators are at the Central Bar, Gateshead. Hannah is no longer with the band who now have Belinda Voshtina - a seriously good singer I'm told. - on vocals. All Party Parliamentary Jazz Appreciation Group Awards 2012 VOTING ENDS MONDAY - VOTE NOW! It's time to vote in the Parliamentary Jazz Awards 2012. This is your opportunity to let those on both sides of The House know that the Jazz Population is a significant mass and when you vote for whoever you vote for you are not just voting for a band or an individual but for the future of jazz itself. Jazz Broadcaster of the Year (Radio, TV or online). 8:00 pm Sinatra Sings. A collection of performances from American TV specials and recording studio footage (repeated at 12:10 am). 10:45 pm Storyville: The Jazz Baroness. The story of Pannonica Rothschild. 7:00 pm Sir John Dankworth at the BBC. 8:00 pm Jazz Piano Gold Archive footage including Basie, Monk, Peterson, Abdullah Ibrahim, Ellington and Herbie Hancock (repeated at 12:05 am). 9:00 pm Barbara Thompson: Playing against Time. Thompson's music and her struggle with Parkinson's disease (repeated at 1:05 am). Paul Edis (pno); Graham Hardy (tpt/flug); Graeme Wilson (ten); Chris Hibbard (tmb); Mick Shoulder (bs); Adam Sinclair (dms). 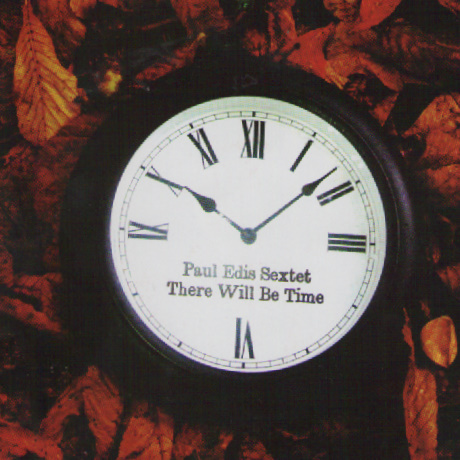 The Paul Edis Sextet are one of the more popular bands on the Splinter Circuit and, on the evidence of this CD, justifiably so. The opening track, Administrate This, a rolling funk groove sees Graham Hardy growling like an Ellingtonian. Hardy is in fine form throughout on both trumpet and flugel horn. Vamp, a melodic, probing theme displays his rich full sound on the latter instrument - smooth as a glass of buttermilk. I Wish I Was a Monk is a catchy theme that could easily become a song. Paul plays a piano intro into the tune before some superb tenor from Wilson who takes it apart returning it to the composer who hands it over to Adam Sinclair. The ensemble take it out. I'll be humming this tune all day! Angular, one of the band's.most played live pieces puts Hibbard into the spotlight with some great slide-work until Wilson once again takes control. There Will Be Time. The title track is a dreamy, richly textured score that has Edis and bassman Shoulder exploring the harmonic structure. Hibbard is again given the opportunity to shine which he does beautifully. The trombonist also features on another moody piece - Elegy. Edis' Blues For Dad - dedicated to Jerry Edis - has some classic blues piano and a Slam Stewart style hummed bass solo. Sharp 9/8 is clever and brings Hardy back into the game the horn man stretching out over the unusual rhythm. The front line all contribute to Revelation and Wilson, Hibbard and Hardy have a good blast on Wilson's Up Late. The disc is peppered with Edis solos and we've had a lot of praise for Paul the Pianist lately but this is much more - Paul the Pianist, the Composer, the Arranger. The disc is officially launched at the Lit and Phil on Friday March 2 - I hope he's prepared for a lot of sales! As advised by Lance, I watched Sonny Rollins at Ronnie Scott’s from 1974; the 1989 Omnibus tribute to Ronnie Scott; and the item about the four important jazz albums from 1959. By the time the Transatlantic Sessions of folk music came on at 1pm, I fell asleep – don’t tell the folkies! These programmes were very educational for someone like myself who missed all this the first time round. Some of the Sonny Rollins went way over my head, but I was impressed by his long solo of improvisations which included many diverse tunes such as (I think!) The Nearness of You; A-Hunting We Will Go; Give a Little Whistle; and some classical music. I was greatly amused by the Scottish bagpipes played by a musician in full kilt and stockings. I didn’t know it was possible to play jazz on bagpipes and it didn’t seem to quite work for some of the tunes. The band included the more usual guitar and drums, and they did tasty versions of Don’t Stop the Carnival and Alfie’s Theme. The history of Ronnie Scott’s up to 1989 was very informative. There can’t be many venues with food where the proprietor advises you not to eat there. The atmosphere seemed just right. Can someone tell me about Ronnie Scott’s now, is it still in Frith Street, and has the food improved? And, more important, is the music still good? The groundbreaking albums of 1959 were Miles Davis Kind of Blue; Dave Brubeck Time Out; Ornette Coleman The Shape of Jazz to Come; and Charles Mingus Ah Um. Most blog readers will already know this but I’d never heard of the last two. I remember listening to the Brubeck as a child and loving it then, mostly for its strong tunes and unusual rhythms. Hints of what was to come in later life. The Exchange Orchestra - Download review. Eirik Svelar; Aubin Vanns - Guitars; Matt Anderson, Ben Lowman - tenors; Emlyn Vaughan - Bass; John Arnesen - Drums. 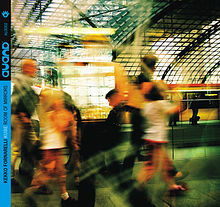 Formed in Autumn 2011 under the initiative of the guitarist Eirik Svela, The Exchange Orchestra (TEO) is an homage to the late Paul Motian's great sextet (the electric bebop band). With the unusual line up of two guitars, two tenor saxophones, bass and drums TEO resonates with a powerful sound capable of executing a broad range of textures. Anchored with a solid foundation in the jazz tradition TEO is driven by the present and seeks to fuse the sound of the individual players with a sense of purpose as a band. Jazz legend and pianist Thelonious Monk is recognised for having been ahead of his time. With his unique style of playing and writing he was able to fuse the roots of jazz with the avant-garde back in the 1940's. TEO seeks to build on these elements in Monk's compositions and through them expose its own individual band sound. This is not a tribute, but a homage suited to an original like Monk; self-discovery through the intimate exploration of music. The above was sent to me by Eirik Svelar and in truth there is little to disagree with. Monk's music, in itself, always strikes me as a little quirky (in a nice way!) so any attempt to personalise Monk's music whilst at the same time paying tribute to another musical maverick - Paul Motian - is a journey fraught with danger. However, these guys from Leeds - it's always Leeds! - make a decent fist of it. Personally, I'd have preferred tenor and alto rather than two tenors although their tones are sufficiently different to avoid it being an issue. It's not a smooth sound but Monk's never was and the four tracks are very listenable. Little Rootie Tootie has a section I'd describe as "Collective Improvisation" rather than "Free" and it works without jarring the senses. The guitar solos are facile and totally in keeping. It may be a work in progress but the Exchange Orchestra are getting there. Judge for yourself - theexchangeorchestra.bandcamp.com. The death of trumpet player Pete Papprill was announced earlier this week. He was held in high regard both as a player and a person as these comments from two of his fellow brassmen show. What can I say? always had a smile and a laugh, old school , could play any tune in any key with all the changes and always sounded sweet. - Kevin Eland. I have known and worked with Pete for over 50 years and have the greatest respect for him both as a gentleman and a very!!! good jazzer who had one of the best ears I have ever known. He will be sadly missed. - Ray Harley. Peter Morgan (M.D/tmb); Peter Hepplewhite, Sandra Wilkinson, Ian Smith, Amber Reeve, Allan Jones (Saxes); Ken DeVere, Dave Parnaby, Steve Hackett, Dougie Armstrong, Miles Watson (tpts); Tony Beard, Bobby Percy, Robin Nixon, (tmb); Joe McMullen (pno); John Duncan (bs); John Vine (dms). Sammy Nestico’s Basie - Straight Ahead (pure Basie), Fantasy for Saxophones (comp. Lennie Niehaus) was pure Kenton, followed by Sonny Rollin’s Doxy (featuring the Blyth based Big Band’s saxophone section) augured well for another first rate session of big band jazz. Ah, but wait…the dance band sounds of the thirties onwards were soon to take centre stage. The audience (‘senior citizens’ in the main) soon took to the floor. Peter Morgan, the band’s affable MD, encouraged one and all to trip the light (not so) fantastic. One couple – the star turn Terpsichoreans on the night – led the way and others followed. Cha Cha Cha, foxtrot, rumba, tango, waltz – you name it we got it. Ol’ Man River and Moon River (excellent ensemble work) were but two of many tunes rattled-off by the Bebside Big Band as the dance floor remained busy. The church hall, resembling a Nissen hut, was a hive of activity during the interval as there was a mass breakout into another Nissen hut where there was a lavish buffet laid on for free. As the saying goes…’Owt for nowt and tuppence change’ so all tucked in. Beer and wine were snapped up at give-away prices and in no time the second set was upon us. Hay Burner and an excellent arrangement of Alfie augured well…ah, but wait…this was a dance band night. The Gay Gordons – I know, hard to believe – had them rocking, well, creaking. One old chap, past his bed time, bade farewell, walking stick raised head high as he exited the hall. The jazzers latched onto How High the Moon as the rhythm section swung it. New York New York sounded good too. MD Morgan thanked the audience for entertaining the band throughout with their loud conversation and the packed hall went home happy with one Last Waltz. Mo Scott Band @ Hoochie Coochie. With Mo what you see is what you get and tonight a crowded Hoochie Coochie got the blues in the nicest possible way. Perhaps in deference to the venue, unknown territory for the diminutive blues belter, keyboards replace Mo's normal guitar cushion. When that keysian player is Stu Collingwood then there's no harm done. In the main, the repertoire's Mo's tried and tested back catalogue yet she still manages to make it sound fresh. Please Don't Let Me Be Misunderstood takes us back to the 1960's, Club Agogo, The Animals, Eric Burden... Mo equals Eric on vocals but edges it on looks! T-bone Shuffle, Hound Dog, Fever, Don't Explain, Is You Is Or Is You Ain't My Baby?, Let The Good Times Roll just a few of the choice cuts with an especial mention for 'Round Midnight - this one almost silences the room - almost. Southpaw Paul Smith slugs it out with some punchy solos, Neil floats like a butterfly, whilst Stu stings like a bee with some two-fisted piano that takes us down Route 66 and off into the night. A great session, a decent sized crowd and a return booking for our own Empress of the Blues. This Thursday's fare at Hoochie is the ever popular Mo Scott Band so expect a whole mess of blues and rock 'n' jazz from the little lady with the big big voice...and it's free! Doors 7pm band 8pm (ish). Bebop Spoken Here on Twitter - or so they tell me! As the Gateshead International Jazz Festival approaches (March 23 - 25) I thought I'd draw attention to one of the concerts I'm looking forward to - Gwyneth Herbert and the Peggy Lee Project with the (virtual) Buck Clayton All-stars. One of the UK’s most well-known singer-songwriter, Gwyneth Herbert, joins forces with the members of the Buck Clayton Legacy Band to explore the jazz repertoire of Peggy Lee. The band’s arrangers, Matthias Seuffert, Adrian Fry and Menno Daams, have taken Lee’s work with Jack Marshall, Quincy Jones and Billy May to create new charts for what has been recognised as one of Europe’s leading mainstream bands. Gwyneth brings her own unique gift for storytelling in song to reinterpret tales of love lost and found, as well as the life affirming qualities of music itself. Expect vibrant playing from what Jazz UK called this “knockout band” plus tears of pain and joy from songs both familiar and less well known. Gwyneth and co-leader Alyn Shipton will also introduce the event with film and audio clips of Peggy Lee herself. With a pre-concert talk at 7pm. Free to ticket holders. "Life is for Living" - The Peggy Lee Project - Hall Two Saturday March 24. 8:00pm. £16.50. PS: Above from GIJF blurb. Highly recommended. Wilbur’s Fate @ The Bridge Hotel. February 12. Use it or Lose it - Grass Roots Jazz in crisis. We need some gigs like this up here! CD Review. Renegade Brass Band - Radio Rebelde. Nicholas Brothers. The greatest dance sequence.